In What Great Trainers Do, Robert Bolton and Dorothy Grover Bolton target the underlying need for trainers to energize and motivate individuals to enact relevant change in their workplaces. They present an approach to attaining well-run training programs that ultimately drive future business for clients. Using time-tested techniques, trainers can deliver dynamic workshops that ultimately help boost profits and positively generate personal growth. From PowerPoint presentations to the effective management of group dynamics, this book offers no-nonsense advice to trainers seeking to create lasting and valuable learning. Creating a framework for training. To build a successful training program, a trainer must integrate content with how the group operates as a whole. Developing a dynamic workshop. Effective trainers are enthusiastic, open-minded, and focused, and they maintain a conversational style. Debriefing to gather the learning. Trainers attain feedback and learning from individuals when they debrief after activities, practices, or presentations. Making presentations interactive. Great trainers involve participants early and often to create learning environments where thoughts are exchanged in a meaningful way. *Evaluating and ending the workshop. Dynamic trainers have evaluation processes where sponsors and participants understand the degree of satisfaction. Serving as a facilitator. Good trainers battle personal and group resistance by intervening when trouble arises. Maturing as a trainer. First-rate trainers redesign failing workshops in real time, should groups feel that coursework is off the mark. Games and Learning Good Bedfellows? With Generation Y, or “Millennials,” coming into the workforce in greater and greater numbers, many companies are now recognizing that old teaching and learning techniques do not necessarily work for younger employees. Millennials are much more apt to learn when a company’s training initiatives take advantage of the technology they use every day. This technology includes PDAs and other mobile devices, apps, and social networking sites. Younger generations also prefer content presented in video or audio format. While many companies have implemented the above technologies in their learning initiatives, one form of technology remains on the fringes of learning: video games. This article from ZDNet speaks to the increased interest in games-based learning for e-learning providers. The aim of employing video games in training programs is to help employees learn in an engaging way. The hope is that games will appeal more to younger workers and help them absorb information better than the typical assigned reading. I think it is great that companies are starting to experiment with new media to see what it can do to aid their learning initiatives. As technology advances, learning must follow suit, and games seem the perfect vehicle for presenting learning content in a new and engaging way. Do you think games have a place in corporate learning strategies? In the education community, a useful body of research evidence related to training development and delivery has emerged only in the last 20 years. With that evidence, training practitioners now have a better idea of how learning occurs in the brain. 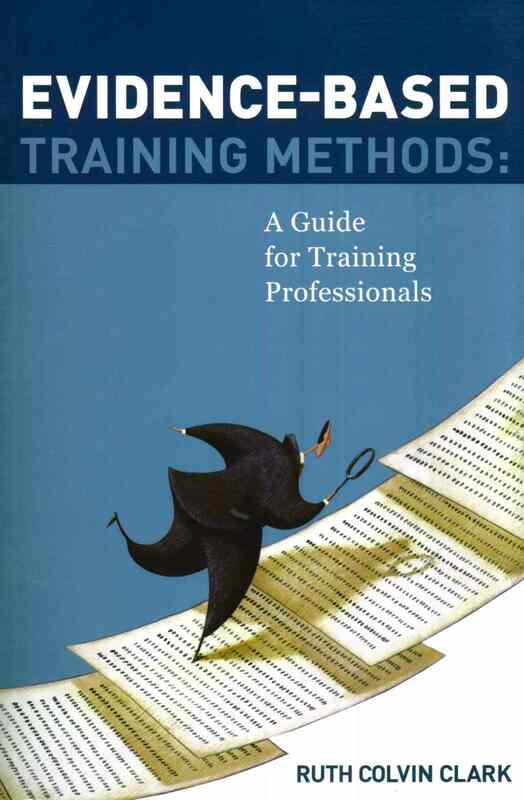 In Evidence-Based Training Methods, Ruth Colvin Clark summarizes the most current research that relates to the decisions training professionals face on a daily basis. She explains techniques that maximize learning, provides evidence about the best ways to use examples and practice, and discusses how to organize content.